If you haven’t checked out the insanity on Graham just north of Skillman you should do so immediately. What started as a ghoulish sale of a dead woman’s belongings that no one would ever think of paying for has turned into … God, I don’t even know what to call it. 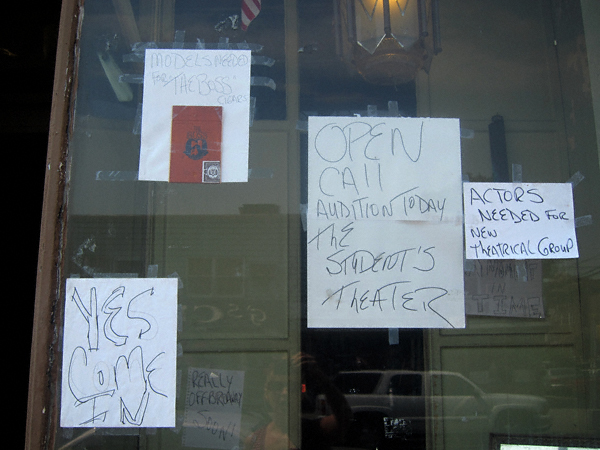 I do know that when they put out the scrawled PRIVATE SALE signs and an old guy would sit outside inviting only young women to come in I just thought it was creepy. Same with when they put the statuary lions out and invited people to take photographs with them. 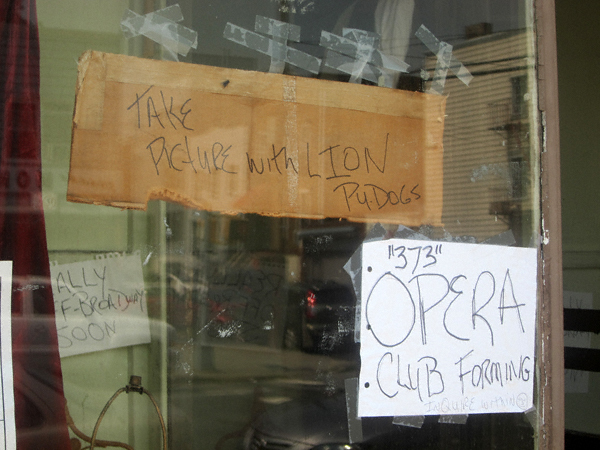 Even the signs requesting “cigar models” and actors for a “theatrical troupe” and announcing the formation of an opera club just seemed odd. 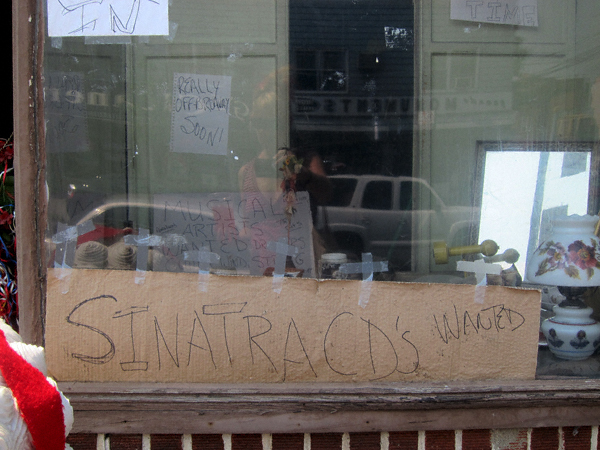 But today’s sign reading SINATRA CD’S WANTED makes me believe that the whole thing may be satire. Today (as you can probably deduce) I swung by to see this for myself. This is most assuredly NOT satire. This one is best seen (and heard) in person, folks. All I can say is WOW! I believe the woman who lived there is still alive, the man is her nephew. She had to go to the hospital and from there he put her in a home. Today as we passed he was handing out flowers and singing opera. He was still handing out flowers around 5:30. This spectacle is just not right, and I hope other family members can step in. Inasmuch as I can ascertain, he is the sole/solitary family member over-seeing this property. The owner, his aunt, has been placed in a home. This has been going on for over a month now. It just keeps getting stranger. 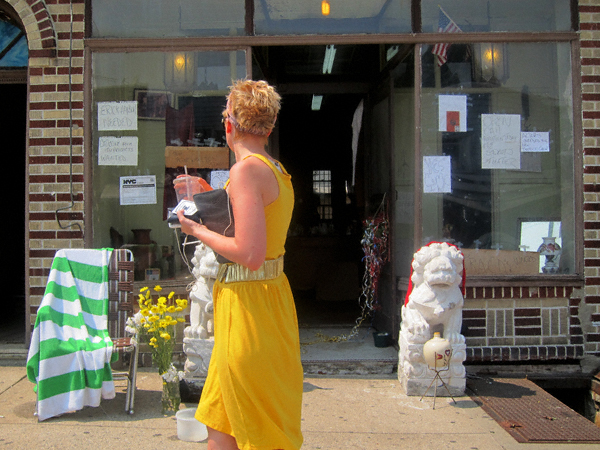 At first it seemed as if he was selling off all of the old lady’s antiques but now it’s just a neverending clusterf*ck. It certainly is not legal for them to turn this residential apartment and sidewalk area into a commercial retail space. He certainly does not have permits to do so. I wish it would stop he makes my friends (mainly the women ones) feel creeped out and nervous!